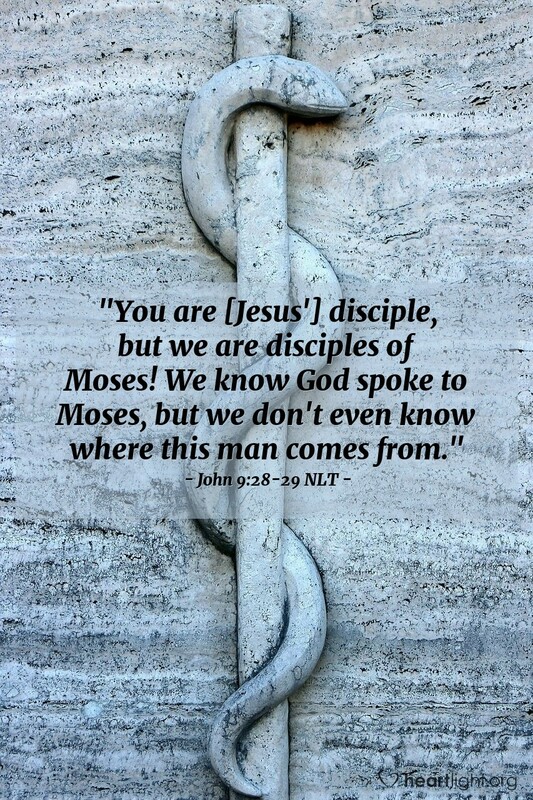 Then [the Jewish leaders cursed the man who had been healed of his blindness] and said, "You are [Jesus'] disciple, but we are disciples of Moses! We know God spoke to Moses, but we don't even know where this man comes from." Sadly, about the only truthful thing the authorities say about Jesus in the whole episode is that they know nothing about him. But, if they really knew Moses, they would know Jesus. If they really knew God, they would know Jesus. So many people reject Jesus because they don't really know him — church experiences, church people, or chosen lifestyles get in their way of knowing Jesus. As we seek to reach the lost, we must remember that the core, the essence, the truth we share is centered in Christ Jesus. Rather than getting lost in a lot of church mumbo jumbo, let's share Jesus with them. Let's help them see the Savior. Dear heavenly Father, thank you for sending Jesus. I know that he is your greatest message. Forgive me for the times that I have gotten lost in religious arguments and forgotten to share Jesus with those who need him. Bless my efforts to share Jesus with those who do not recognize him as their Lord and Savior. It's in Jesus' precious and mighty name that I pray. Amen.